Hi babes! Happy Friday! Today is the start to the big Sephora Sale and lasts until Monday, November 19th. Everything is 15% off – which makes it such a great time to stock up on your beauty favorites and save. 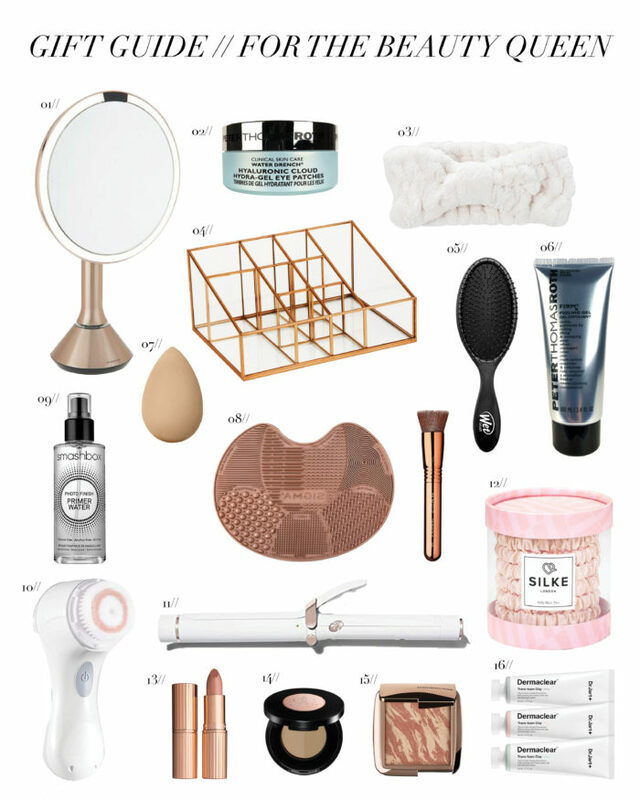 I thought it would be the perfect time to share my gift guide for the Beauty Queen and a few of my favorite beauty items. The Sephora sale is for Beauty Insider members which is Sephora’s reward program – that is amazing if you have yet to sign up. Signing up is easy and you get so many fabulous benefits-sign up here! Right now members gets 15% off purchases with code BIBONUS. A lot of the items in today’s post is from Sephora. They also have a gift guide section with lots of great gift ideas! So many great gifts all all these items I either own and love the products or want them myself! Y’all have heard me talk about my T3 Curling Iron (1.25 in barrel) for my everyday waves! It’s 15% off right now and it comes with a 2-year warranty! This silk hair ties are so cute and are great for your hair. They protect your locks from damage, breakage and split-ends by eliminating the friction, snapping and clawing of traditional hair ties. Plus they stay in place and are so cute! This brush cleaning set is a must if you use good makeup brushes. The cleaning mat deep cleans any other brush in your collection, ensuring perfect makeup application and clean, beautiful skin. I love the rose gold! The SimpleHuman Mirror is such a great gift! I use this every single day and it’s life changing! It’s currently on sale! For the skin care obsessed theClarisonic is a great gift! Another product I have used every single day for over 7 years! Right now 15% off! Hourglass Bronzer in Luminous Bronze Light – this is the most natural bronzer I have ever used. The color is perfect and it doesn’t look like I am wearing makeup when I wear this. Marc Jacobs Omega Bronzer Perfect Tan – I love this ESPECIALLY in the colder months when I have no tan. I use this on my face, neck and chest. The color is natural and gives my skin a good glow. Nars Blush in color Dolce Vita – I LOVE this color blush. Estee Lauder Double Wear Foundation – the best foundation! Stays in place all day and doesn’t get cakey. Shop my other Gift Guides here! Appreciate the $25.00 and under list!